After being nominated for seven Grammy Awards (thanks to two of the year's biggest hits: "Blurred Lines" and "Get Lucky") and nominated at the Critic’s Choice awards for his song Happy from the "Despicable Me 2" soundtrack, Pharrell Williams has also landed an Oscar nomination for best original song. The singer-rapper-producer, who has also served as a music consultant for the Academy Awards said he was speechless after the receiving the nod. "Uh, speechless," said the 40-year old Pharrell said in an interview following the Oscar nominations. "Man, I am over the moon." "I used to stare at the TV as a child watching your actors and favorite actresses take it home," also revealed the singer. "That's where Jack Nicholson stands or the guy that I look up to majorly, Wes Anderson. That's where his work is considered. I cannot believe we get to go." 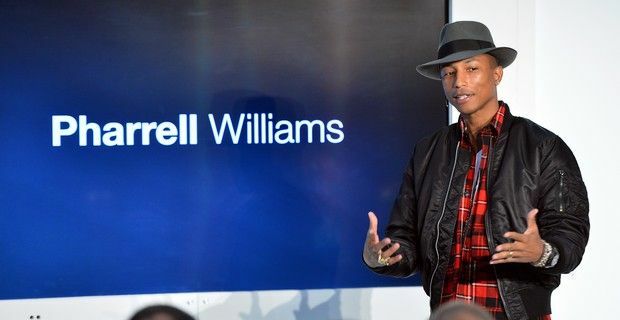 Pharrell will be releasing his second album in 2014 that will also feature the single "Happy", after signing with Columbia Records, and is co-composing the score with Hans Zimmer for The Amazing Spider-Man 2 movie. In the Original Song category at the Academy Awards, Williams will be up against U2, who took home the Golden Globes award for "Ordinary Love," from the biopic "Mandela: Long Walk To Freedom," Karen O of the Yeah Yeah Yeahs for the "The Moon Song" from director Spike Jonze's "Her", "Alone Yet Not Alone" from the movie of the same name and "Let it Go" from "Frozen." If Pharrell wins the Oscar he’ll be the third rapper to receive the statue after Eminem for "Lose Yourself" from 8 Mile and Three Six Mafia for "It's Hard Out Here for a Pimp" from Hustle & Flow. The Grammys will be presented January 26 at the Staples Center in Los Angeles, while the 86th edition of the Oscars will take place on March 2nd always in Los Angeles, with Ellen DeGeneres hosting for the second time.